Generation of NC programs is performed by a postprocessor that transforms the CLDATA commands of a calculated toolpath into the format of the selected CNC system. The postprocessor files have the *.sppx extension. The output of CNC code is performed into a standard text file, so it can be easily transmitted from the computer, where SprutCAM is installed to the CNC control using any standard methods of copying files and folders. To generate CNC code press the button. The NC-program generation panel will appear. 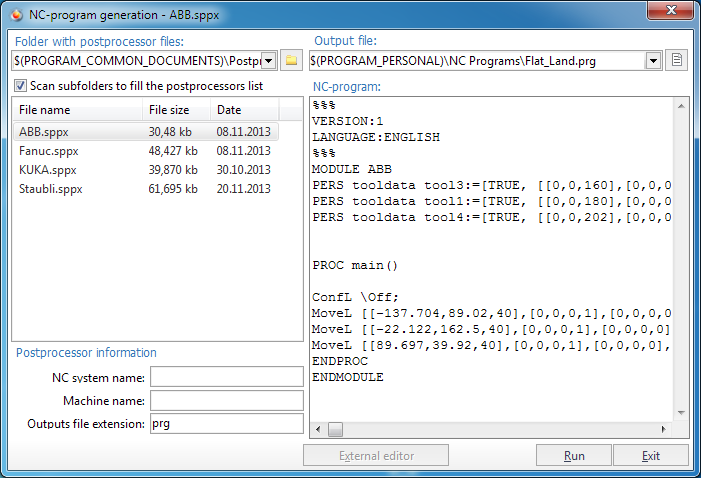 Here you can select the required postprocessor from the <Postprocessors list> and run it to get an NC program. If the list doesn't contain the postprocessor you want, try to select another <Folder> with postprocessor files using the appropriate controls at the top of the panel. General information about the selected postprocessor is displayed in the left-hand bottom corner of the panel. In the <Output file> field one enters the name and the path to the file, which the NC program should be output to. To start generating NC program for the selected CNC system press the <Run> button. In the full version of SprutCAM NC code is written to the output file, and, if selected, into the postprocessor window. In the demo version, output into a file will not be performed, and only the last few strings of the NC program will be displayed in the postprocessor window. One should note, that the postprocessor only creates NC code for all calculated machining operations that are 'enabled' at the time the postprocessor is run (column <On> in the machining process list window). Note: If one needs to generate several separate NC programs for different operations, it is advised to first execute all the machining operations. And then, by placing ticks in different <On> boxes in the machining process window, run the postprocessor to create the separate NC programs. The postprocessor system for SprutCAM is a separate standard module, and can, if required be run separately from SprutCAM. The name of the executable file is – Inp.exe. Postprocessor tuning files for CNC systems are created and edited using the <Postprocessors generator> (INP.exe).